Time to lay all my geek cards down on the table. I can recite just about every original Star Trek episode by heart, and several episodes of Star Trek: The Next Generation, too. I also have, hidden away in my garage, hundreds of comic books dating from roughly 1977 through about 1986. Now, when the iPhone arrived I got very excited about its potential as a comic-book reader. Unfortunately, all the comics I’ve read on the iPhone have been disappointing. Viewing PDFs in a PDF viewer app is unwieldy. Genus’ Kamikaze reader is promising, but too complicated and slow for my tastes. ComicZeal ( ) is quite good and getting better, but navigation of those big paper comic-book pages is still a pain on the iPhone’s too-small-for-comics screen. After all my initial excitement, I had almost given up hope of using the iPhone as a comic reader. But last week I had the best iPhone-comic experience I’ve had yet, and get this: it tosses in some Star Trek geek points for good measure. It’s IDW Publishing’s Star Trek: Countdown, a four-issue prequel to J.J. Abrams’ forthcoming Star Trek blockbuster. All four issues of “Star Trek: Countdown” are available on the App Store for $1 each, wrapped in iVerse’s Comic Reader software. The interface is as simple as can be. There’s no pinching to zoom in to read the words, because each screen is a single panel, dialogue included. When you’re done reading one panel, swipe your finger and the next one appears. iVerse has done a clever job of fitting the source material into iPhone format. For example, extremely wide panels are split in two, so that you read the left side of the panel, then swipe to continue the dialogue in the right side of the panel. (Not that you’d even notice—the transitions between panels are seamless, and the dialogue and action flow well.) When possible, the developers even re-orient word balloons from the printed edition to fit the iPhone's layout. Of course, this sort of approach to a comic will only work on comics that adhere to certain rules. Comics that feature huge splash pages, oddly shaped panels, and difficult-to-follow reading sequences might not fit into the format. But the experience of reading “Star Trek: Countdown”—not to mention the low price per issue ($1, compared to $4 in a comic shop)—make me wonder if lots future comics will be drawn with iPhone conversion in mind. A wide panel is seamlessly split into two iPhone-sized panels. 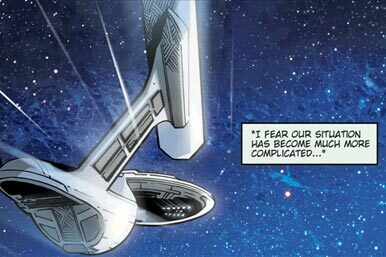 Regardless of what that means for the future of comic books in paper form, I can’t deny that “Star Trek: Countdown” was the best comic-book reading experience I’ve had on the iPhone yet, by a long shot. ‘Nuff said. Star Trek: Countdown is compatible with any iPhone or iPod touch running the iPhone 2.x software update.